Summer is usually one of the most anticipated seasons of the year. After all, there is no better time to enjoy the outdoors and the sunshine. But summer also brings about a number of changes to our planet, from warming temperatures to dangerous thunderstorms to fireflies that flash in unison. Temperatures get warmer — and heatwaves are more common. Nothing says summer like warm weather. This rise in temperatures is caused by the tilt of the Earth's axis. Our planet doesn't sit perfectly straight as it spins — instead, it has a slight lean of approximately 23.5 degrees with respect to the sun as it rotates, called the axial tilt. So, throughout the year as the earth revolves around the sun, this axial tilt causes the planet's northern and southern hemisphere to bask in different levels of sunlight, giving rise to the seasons. In the summer, the sun's rays hit the Earth at a steep angle, the light doesn't spread out as much, and so any one spot receives more energy from the sun, increasing temperatures. This effect is amplified by the longer summer days. Heatwaves are most common in summer when high pressure systems develop across an area, trapping the heat. And, as climate change continues to rise temperatures, scientists predict there will be more frequent and severe heat waves in summer. The Arctic Circle enjoys 24 hours of light. North of the Arctic Circle, or roughly above 66 degrees in latitude, the sun is visible for 24 hours a day for a given time-frame depending on how far north you are. And at the North Pole, it will be daylight all day from March 21 to September 23. This phenomenon is popularly called the "Midnight Sun," and it too is a result of the axial tilt. While at the equator, the sun seems to rise straight up into the sky and set straight down at the horizon, back in the far north latitudes, the sun appears to travel in a slanting 360 degree circle in the sky. So, even when the sun is below the horizon, it isn't there for very long, nor is it very far below the horizon, keeping the sky alight all night long. The southern hemisphere experiences all the above phenomena too, just on the reciprocal side of the calendar. The stars that we see at night change. As the earth orbits the sun, the part of the night sky that is in our view changes. What this means is that most of the star patterns, or constellations, that we see on a summer night are different from those that we see in the winter, according to Space.com. In other words, in the summer, we can see the stars that during the winter were in our daytime sky, and thus were invisible to us. Of course, this change in which stars we see doesn't happen all at once. The change in the night sky is subtle from night to night, But, as the season progresses, reports Space.com, a given star sets about 4 minutes earlier each night, so over a month, that means it sets two hours earlier. Gradually, the stars that were low over the western horizon during the early evening hours eventually disappear entirely from our view over a few weeks and their place is taken up stars that earlier were higher in the sky at sundown. Since the planet completes a circle every year, patterns and constellations re-emerge on schedule every season. For example, it's a great time to see the Big Dipper in the summer. Thunderstorms — characterized by rain showers, thunder, and lightning — can occur year-round, according to NOAA, but they are much more prevalent and generally more severe in the warmer months of summer. This is because moisture and rapidly rising warm air play an important role in forming these storms: High humidity and warm temperatures result in large amounts of warm, moist air rising into the atmosphere. As the moisture rises, condensation occurs and water droplets form as they reach the colder temperatures of the high altitudes. Some of the rapidly rising moisture freezes in the upper cloud regions. While evaporation and condensation continues, turbulence is created and droplets of moisture collide with one another, knocking off electrons and creating charge separation. The newly-knocked off electrons gather at the lower portion of the cloud (giving a negative charge) and the rising moisture carries a positive charge to the top of the cloud. 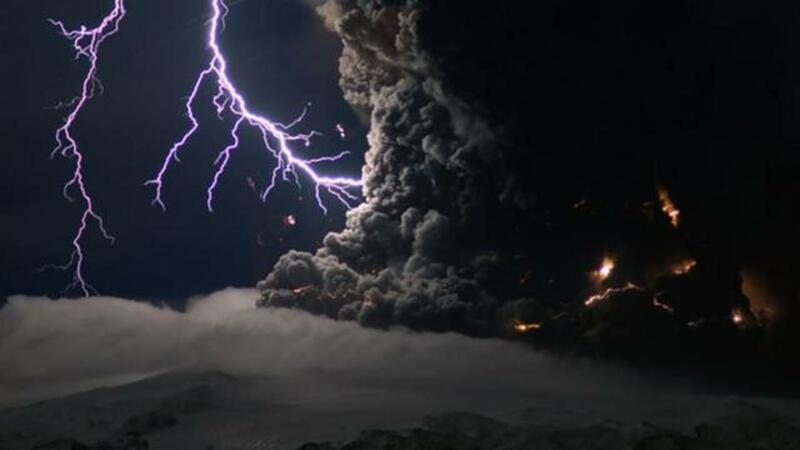 The violent process continues until the positive and negative difference is so great that a conductive path is formed, creating lightning, which is the high-voltage, high current surge of electrons. Lightning bolts are so hot at the core that they rapidly heat the air as they pass through it. This, followed by a rapid cooling after the bolt passes, creates intense sound waves that we call thunder. Fire rainbow clouds are sometimes spotted on summer days. Fire rainbows, technically known as circumhorizontal arcs, are distinctive clouds, easily recognized due to their bright rainbow colors and flame-like shape. These ice halos are formed by hexagonal, plate-shaped ice crystals that occur in high level cirrus clouds. The halo is so large that the arc appears parallel to the horizon. The clouds occur mainly during the summer months at particular latitudes because the sun has to be at a very precise position in the sky — an elevation of 58 degrees or higher — in order for the rainbow colors to appear. When the sun is at this position, sunlight enters the clouds' ice crystals and is refracted (split) into individual colors, just as light does when it passes through a prism. The location of the observer is also important, which is why fire rainbow clouds cannot be seen in latitudes north or south of 55 degrees. After sunset, night-shining clouds sometimes appear. Also known as noctilucent clouds, night-shining clouds are tendril-like with a blueish tinge. They are usually visible against a darkening, summer skies. These clouds hang at the edge of space, and are formed from tiny ice crystals approximately 50 miles high above the earth in the upper part of the mesosphere. The ice crystals only form this high when the air gets extremely cold (minus 190 degrees Fahrenheit) and these conditions only occur in the high mesosphere during the summer months near the poles. This happens because the polar regions heat up during the summer and the relatively warm, wet air rises, expanding rapidly which causes it to cool rapidly as well. The ice particles that make up these clouds actually "seed" on meteoric smoke, according to NASA, which is comprised of tiny, floating remnants of meteors that burned up entering Earth's atmosphere. Whales are spotted feeding along northern coastlines. Summer is prime whale-watching season because a large number of whales migrate to their popular feeding grounds along northern coastlines. For example, every summer, humpback whales feed in the high-latitude waters near the Gulf of Maine in the Atlantic Ocean, as well as the Gulf of Alaska in the Pacific, reports NOAA. As baleen whales, they eat mostly tiny crustaceans, such as krill and plankton. This species of whale is always popular with whale watchers because they perform aerial displays while they feed. They are often seen breaching the water or slapping the surface with their long pectoral fins, tails, or heads in order to gather up large amount of krill and plankton. Other species that are sometimes spotted in these same summer feeding grounds include Minke, Finback and Right Whales.